Self-driving cars are trained to be overly cautious, but there may be situations where they need to make high-speed maneuvers to avoid a collision. Can these vehicles, festooned with tens of thousands of dollars worth of high-tech sensors and programmed to drive at grandma-speeds, handle these split-second decisions like a human? Engineers at Stanford University may have the answer. They created a neural network that can enable driverless cars to perform high-speed, low-friction maneuvers just as well as race car drivers. When they eventually arrive, driverless cars will need capabilities beyond those of humans, as 94 percent of crashes are attributable to human error. Researchers say this is an important step in improving autonomous vehicles’ ability to avoid accidents. The team used a type of artificial intelligence algorithm called a neural network, which is loosely based on the neural networks in our brains, to create the self-driving system. Neural networks are a type of machine learning where programmers build models that sift through vast stores of data and look for patterns. These networks are used to power an autonomous vehicle’s “brain,” typically high-powered GPUs stored in the trunk of each vehicle, that control the decision-making process. The Stanford team trained a neural network with data from 200,000 motion samples, including test drives on slippery surfaces like snow and ice. They then took their system to Thunderhill Raceway in the Sacramento Valley to test it out. 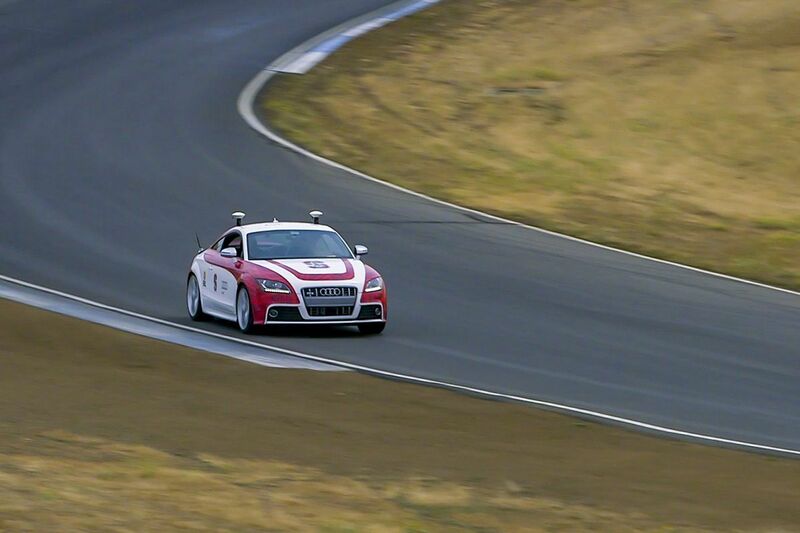 The Stanford team used two self-driving cars in their tests: Niki, an autonomous Volkswagen GTI, and Shelley, an autonomous Audi TTS. First, Shelley sped around controlled by the physics-based autonomous system, pre-loaded with set information about the course and conditions. When compared on the same course during 10 consecutive trials, Shelley and a skilled amateur driver generated comparable lap times. Then, the researchers loaded Niki with their new neural network system. The car performed similarly running both the learned and physics-based systems, even though the neural network lacked explicit information about road friction. The team says they were encouraged by the results, but stress that their neural network system does not perform well in any environment. They require — what else? — more data to be able to handle a wider range of conditions.